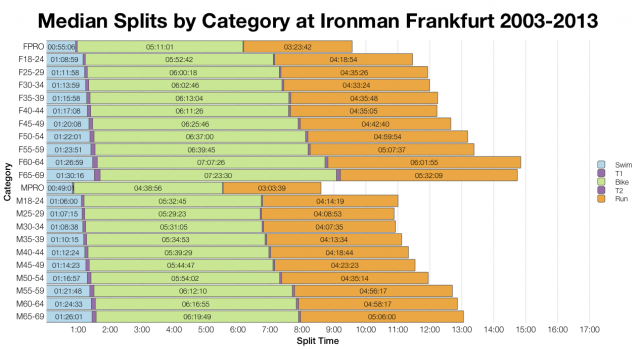 Ironman Frankfurt is consistently a fast race and this year was no exception. Results at this year’s event are largely comparable to previous races with a very slight improvement in times for the top 5% of competitors. Otherwise it appears to have been business as usual in Frankfurt. 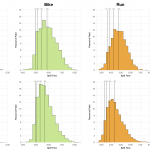 The median splits across age groups suggest that while the overall race closely matches past results this year’s bike was marginally faster and the run somewhat slower. 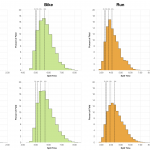 Differences, particularly on the bike, tend to be small; there’s no significant deviation in performances. 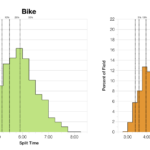 In the pro field the medians shift a little differently – average male splits being a little on the slow side while the women saw a big jump in average bike times. 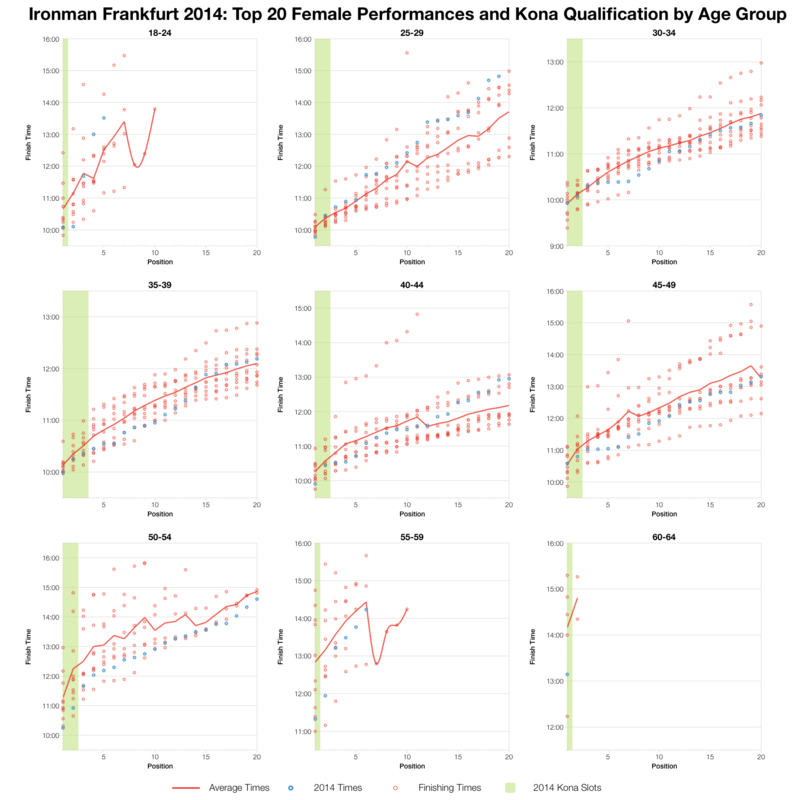 The composition of these smaller categories has a much bigger impact on the annual race statistics than individuals within large age groups. Distributions confirm these differences. This years swim is largely identical to past results, bike a little faster and run a touch slower. The overall distribution balances out to give similar results with only that small improvement in times for the top 5% to note. Also worth mentioning is the 22:00 cut off that removes any finishers beyond 15 hours of race time from these charts, truncating the tail from the overall results. Such a cut off influences entries – if you expect to take longer than 15 hours you don’t enter Frankfurt – and will be a contributing factor to its fast average times. The cut off has been in place for a while so it’s reasonable to compare numbers with past Frankfurt races though. At the front of the pack, as the distributions suggested, we saw a lot of fast racing. 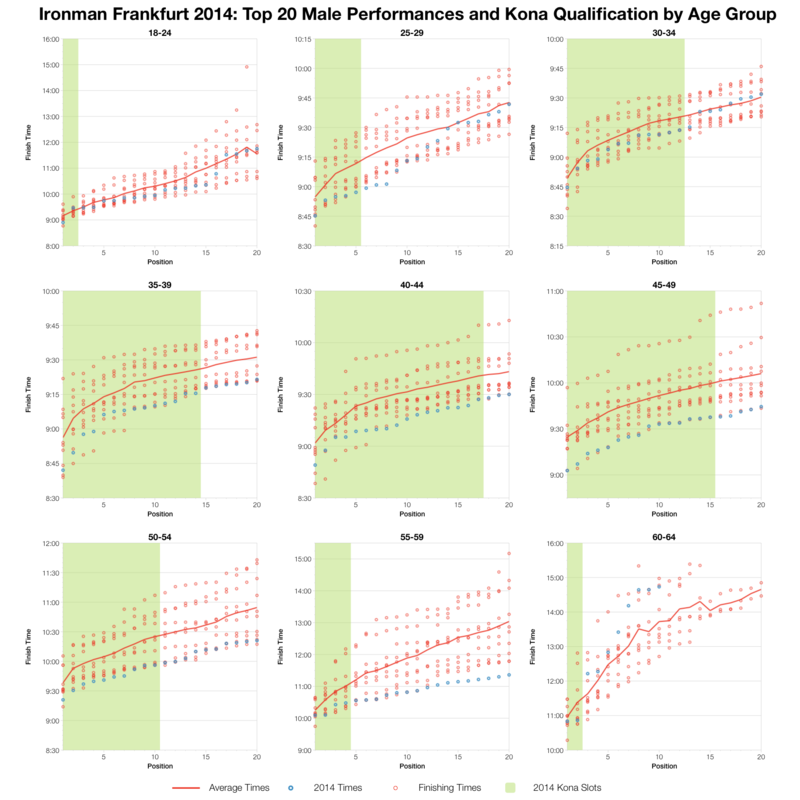 In the men’s field most top twenties were significantly faster than average; not necessarily the fastest times seen, but not far from them. In the smaller women’s field it’s a little more variable and generally times at the very front fall close to or slightly faster than average. It was as competitive a year as ever with a shift towards the fast end of performances for Frankfurt. 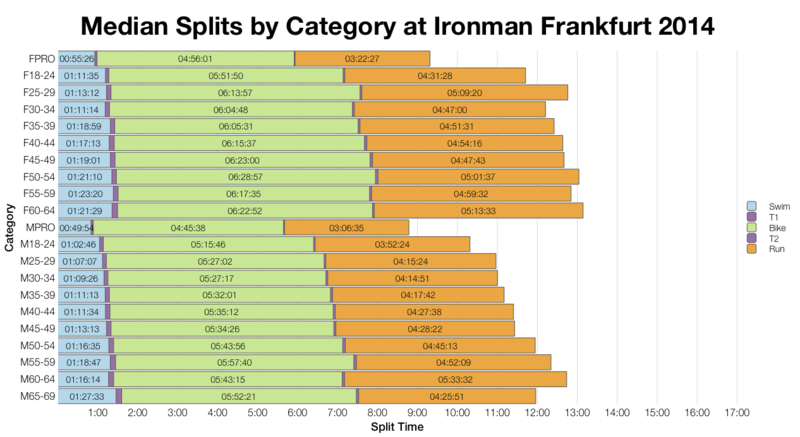 You can view a spreadsheet of the full results and splits from Ironman Frankfurt 2014 on my Google Drive.